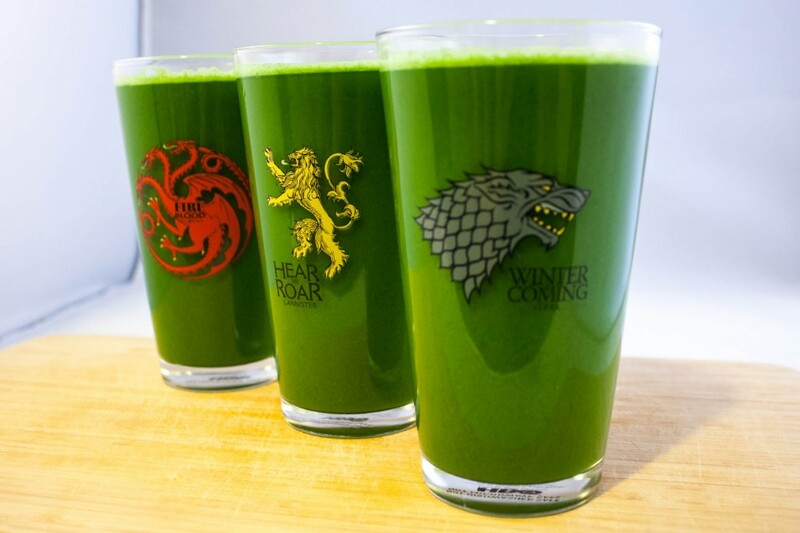 Few things satisfy me like a brilliant, jade-green glass of green juice bursting with nutrition and hydration. I follow a few simple yet important practices to attain that perfectly balanced liquid gold. If a piece of produce is about to go bad, you’re not going to salvage it by crushing it with a machine and drinking its stale juices along with any microbes and parasites hitching a ride. This same rule applies to washing your produce, too. Wash it carefully, leaf by leaf. Need I tell you about the time I boiled some kale and a fat white grub worm floated to the top of my soup? Put another way, if you wouldn’t toss it into a salad you’d serve your in-laws, don’t juice it. Unless you hate your in-laws. How many times have you been to a buffet and been told, “Pace yourself or you’ll be sorry”? Your juicer has a limited amount of fruit and veggies that can be shoved down its feed chute at any one time. Now, that’s a good thing. As I explain in my post on how to choose a juicer, masticating and twin gear juicers are superior to centrifugal juicers because they preserve more nutrients and have higher yield volume. Masticating and twin gear juicers take longer to pull out all that nutrient goodness because they carefully crush and chew the fruit and veggies before squeezing the pulp dry. Think of it as slowly chewing and thoughtfully savoring your food. For best results, alternate hard and soft veggies (cucumbers, spinach) and fruit with hard and fibrous veggies (celery, carrot, beet). Cut apples into eighths — quarter them, remove the seeds and core, then halve again. 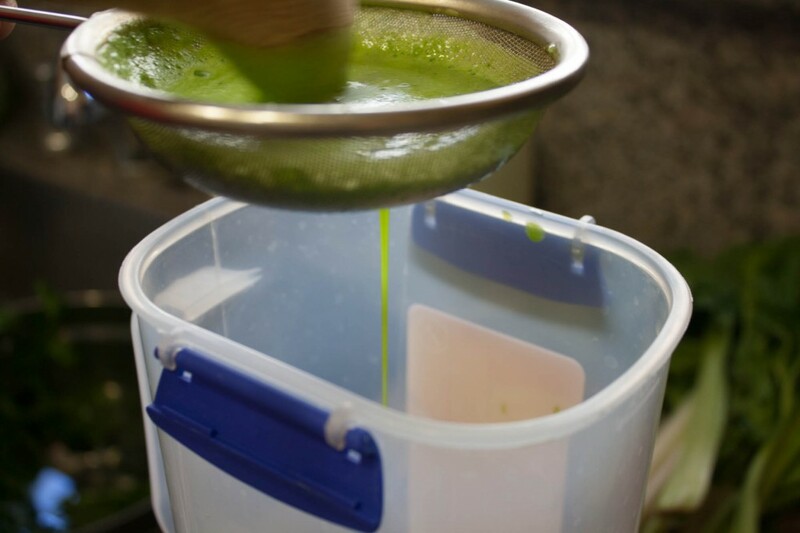 If you go too fast, your juicer will let you know by foaming or overflowing up its chute. Just let it slowly go down before dropping in your next piece. Juicing is qualitatively different from blending because the juice bypasses digestion and is quickly absorbed into the bloodstream, giving you an instant energy boost. Blending results in smoothies that, while full of soluble fiber, still take energy to digest. Depending on your goals (detox or weight loss), you may or may not want to ingest “the bits.” These are the tiny smooth porridge-like plant matter that don’t get pushed out with the pulp and end up in the juice. Even my Green Star produces them in its thick opaque juice; a centrifugal juicer’s bits are larger and more obvious. The solution? Strain your juice to remove particulates. This will give you the smoothest juice possible which will absorb more quickly into your bloodstream. Simple yet effective. Need a green juice recipe? Try mine. Have a perfect-juice tip I missed? Share it in the comments below!